Former President Olusegun Obasanjo has called on Nigerian politicians to stop using the young people as thugs during elections. He also called on politicians to make amendments to the laws and party structure to enhance the access of young people to political offices. He said politicians who engage other people's children for violence often keep their own children away in "safe havens." Mr Obasanjo stated this in a paper titled "Demystifying Leadership Capacity Deficit of African Youths: Our Future is in their Hands." He delivered the paper in London at the inaugural edition of King's College London Global Leaders Engagement Series. He made a copy of the paper available to PREMIUM TIMES on Wednesday. "Enough of using other people's children as experimental subjects and keeping ours in safe havens. Enough of using other people's children as political thugs and ballot box snuffers, while we send ours to Ivy League schools. Enough of thinking we know what is right for young people without their input or the courtesy of asking for their opinions," he stated. He said though young Africans are not too young to run for political offices, they face "insurmountable barriers, which include the hurdle of outrageously exorbitant cost of party nomination forms and campaign costs, which were put against them and made them stay away." Mr Obasanjo said lack of economic opportunity, inclusion and adoption of policies on education, skill acquisition, empowerment and employment were some of the obstacles hindering the youth of Africa from playing active roles in leadership, development and peace building. However, he said despite these hindrances, he saw hope of a continent where the creative energies, intellectual prowess and ingenuity of the continent's youth is capable of leading Africa to the Promised land." Mr Obasanjo lamented that many young people are systematically marginalised because of their young age, limited opportunities, and projected lack of experience. He identified insurmountable barriers against youth seeking elective posts, stressing that Africa must learn to train the youth to succeed their leaders. "Succession planning is a culture that Africa needs to imbibe. It increases the number of people who are capable and available to assume leadership roles when the incumbent is no longer available to do so. This, ladies and gentlemen, is a deliberate process. "We cannot continue to assume that by mere observation from afar, young people understand why we do what we do. We must introduce them to our networks and partners; set them up to represent us in important meetings while we can still guide and nurture them. An organisation should not kaput because one person is no longer available to lead. "If constitutional changes are required, let us begin now. If policies and political party structures have to change, let us begin now. Of what use is a law that allows young people contest for a particular office only to be confronted with the hurdle of outrageously exorbitant cost of party nomination forms and campaign costs?" He urged young people to continue to engage political leaders "till they lower the cost of election and governance in Africa. Young people are not too young to run for political offices but insurmountable barriers are put against them. Adults running for elective offices, octogenarians or over, are also barriers to the young in getting to political leadership. "Special attention and consideration must be given to the girl child. We have to ensure that they have equal opportunities as boys and see them collectively as our 'tomorrow', not a part of it. Understand that a girl can learn to be homely and still be a great scientist. A child is first human before his or her gender. Like the male child, girls have dreams and the wherewithal to achieve them. "I will also like to talk about entrepreneurship. It is the buzz word on the street. And I am glad that our youth have been bitten by the bug. They are building businesses and not all waiting to be employees. This paradigm is much needed at a time like this. "I, however, urge them to do more than create businesses that will cater only for their personal survival. At the onset, they must broaden their mind and vision for their businesses to grow from micro to small and from medium-scale ventures to corporations. "They must deploy technology to make friends and meet business associates across the globe to build international brands. They must think global and begin by acting local. Government needs to also come to their aid -another reason they must be actively involved in governance. Government must make policies that encourage their businesses and expand their horizon. "The young people must remember that the future is influenced by the present and the past. The present is a legacy of the past, handed over by other generation. This legacy is a product of hard work, successes, failures and experience. It must be preserved. The youth must understand that today's leaders are tomorrow's seniors and the record of their leadership will also become a legacy to another generation. 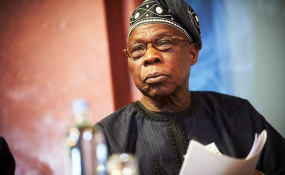 "This is one of the major reasons I set up the Olusegun Obasanjo Presidential Library especially its Youth Development Centre and the Centre for Human Security and Dialogue to serve as nursery for training Africa's future leaders through formal and informal debates, dialogues, interactions, discussion, research and visits. "By the year 2050, it is estimated that African population will be well over two billion and 80% will be living in cities. It is going to be a great challenge and great opportunity. Whether our population is turned into great asset or great liability and danger, our efforts at protection and security will be determined by our politics and governance, our partnership within and outside Africa and our handling of education, infrastructure, agribusiness, technology and the economy, generally. "As we endeavour towards realizing Agenda 2030, which recognizes that the challenges to peace and security are rooted in developmental deficits, we must identify and tackle the obstacles that hinder the youth from playing active roles in leadership, development and peace building. "it is pivotal that we recognize, support and promote the role of youth in the implementation of Agenda 2063 for Africa and the United Nations Sustainable Development Goals for 2030. "I see hope in that the future of Africa is in the hands of its youth. I see hope of a continent where the creative energies, intellectual prowess and ingenuity of our youth is capable to lead us to our promised land. I see hope in the courage of our youth to hold government accountable and their resistance to tyranny and despotism. "I see hope of a thriving continent, made better by the youth than they met it. I see hope in the honest labours of young people on the streets, who shun illegal money-making means and who sweat daily to earn a living. I see hope in our youths who despite all they have seen and experienced, still believe in the dignity of hard work with tremendous energy, ingenuity and commitment. "And it is this hope that we must keep alive. Fear has no place in hope. We must be hopeful in our actions and perception of our youths. And while we still can, we must give them all the support knowing that when we are no longer here, they will carry-on the torch, guiding it with their all. More than ever before, I believe in African youths and their capacity as I have seen them and understood them. And as for hope, they are the reason while an octogenarian like me is filled with hope of a united, progressive, integrated and prosperous Africa, taking its rightful place in a global decision-making process and in the international division of labour and production. Mr Obasanjo said that African leaders "must partner with young people to use their strength in prevention of violence and recruitment into violent and extremist groups and embrace promotion of peace through peer-to-peer education and sharing. "Young people must continue to take advantage of the social media to organise themselves. It is pivotal that we recognize, support and promote the role of youth in the implementation of Agenda 2063 for Africa and the United Nations Sustainable Development Goals for 2030." Mr Obasanjo, who would be the first speaker in the King's College London Global Leaders Engagement series, applauded the brilliance that went into starting the platform, which was meant "for African leaders to showcase diverse ways in which they are producing ideas for Africa's development and the security of Africa's future." He commend the authorities of King's College, London for the initiative, "especially Professor Funmi Olonisakin, Vice-Principal/Vice-President (International)."